Just like its namesake, the 1968 GT500KR, the 2008 “King of the Road” packs a walloping dose of Ford performance. The Ford SVT-engineered 5.4-liter supercharged V-8 is enhanced with a Ford Racing Power Upgrade Pack that boosts horsepower to an estimated 540-hp and torque to 510 ft.-lbs. It’s worthing noting that Ford are only producing 1000 of these, so you can expect the price to be a hefty one. Now I have previously stated that to me Carrol Shelby is just another guy, because Growing up in Australia not to many people know who the guy is unless you area die hard Ford fan. 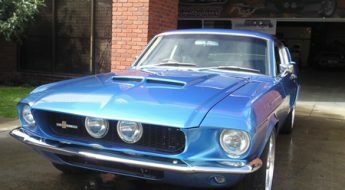 But through the months I have come to appreciate his work over the time and although I don’t like every car he has had his hand in making I do recognize his contribution to the American Muscle car. 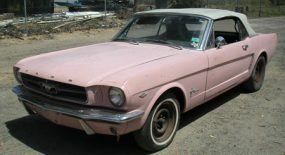 So a big 67mustangblog Happy Birthday to Carroll. 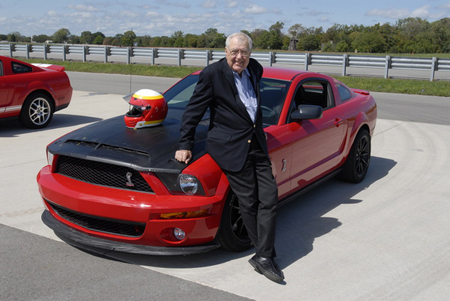 LAS VEGAS, Jan. 11, 2008 – Automotive legend Carroll Shelby shares his 85th birthday with a new performance standout – the 540-horsepower 2008 GT5000KR, which begins production today. 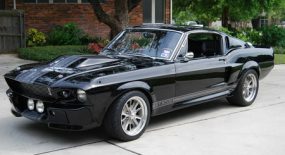 The GT500KR or “King of the Road” Mustang is the fourth limited-edition Mustang that Shelby Automobiles and Ford have brought to market since resuming their collaboration in 2001. 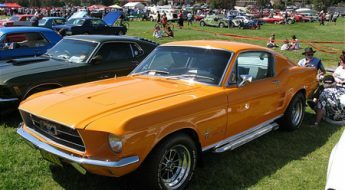 It builds on the performance and success of the 500-horsepower Shelby GT500 – the most powerful production Mustang ever. 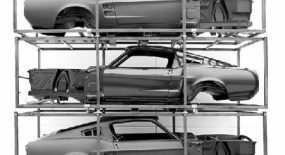 Each Shelby GT500KR begins life as a GT500, built at AutoAlliance International Inc., in Flat Rock, Mich. From there, the cars are shipped to Shelby Automobile’s facility in Las Vegas, where a Ford Racing performance pack, exhaust system and short-throw shifter are installed. The GT500KR also is fitted with body, chassis and interior components. Every GT500KR will be hand customized and delivered to each customer in an enclosed transporter, just like the legendary Ford GT. To fine-tune the GT500KR’s chassis – stiffened 50 percent to deliver increased body control – SVT engineers and Shelby put the GT500KR through a rigorous testing program developed specially for SVT products, including a 12-hour racetrack durability test. The result is a car with increased performance capability that is still comfortable to drive on the street. The GT500KR’s aerodynamics were fine-tuned to add 50 pounds of downforce over the front axle and move the center of aero pressure forward in the vehicle to improve high-speed balance and downforce under high-speed braking. A new front splitter design works with the hood and revised rear spoiler to deliver these benefits. The bottom line: the GT500KR sets new performance standards for Mustang handling and straight-line performance on the racetrack, slalom course and skidpad. The Shelby GT500KR team sculpted a modern interpretation of the original’s bulging hood scoop, a visual indication of the extra horsepower packed beneath it. The hood is secured by a pair of stainless steel, twist-down hood pins. 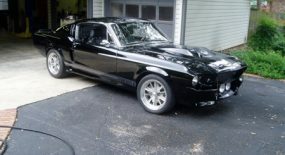 Just like its namesake, the 1968 GT500KR, the 2008 “King of the Road” packs a walloping dose of Ford performance. The Ford SVT-engineered 5.4-liter supercharged V-8 is enhanced with a Ford Racing Power Upgrade Pack that boosts horsepower to an estimated 540-hp and torque to 510 ft.-lbs. The added power comes thanks to revised ignition and throttle calibration and a cold air intake system that replaces the stock unit. The Shelby GT500KR cold air intake seal was designed in unison with the new carbon fiber hood to prevent hot engine compartment air from reaching the air intake. 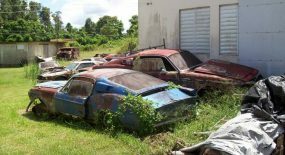 Power is delivered to the rear wheels through a Tremec TR6060 six-speed manual transmission and 3.73:1 rear axle ratio, compared with the GT500’s 3.31:1. To perform optimally on track and during performance driving, the Shelby GT500KR has been fitted with an elevated axle vent reservoir to prevent axle fluid expulsion. Gear selection is courtesy of an all-new Ford Racing short-throw shifter making its debut on the GT500KR. Topped with a white ball, the new shifter throws are 25 percent shorter than the unit on the GT500 providing for crisper, sharper shifts.